I loved all three teams that were eliminated from the Upper Division, but honestly, All Ready were most intriguing to me. Love their latin vibe combined with some hip hop. Dang. The thing that bugs me, even though I loved the three teams that won, is that there is serious training and skill that goes into ballroom and Tap. I kinda feel like, sometimes, these styles don’t get the credit they deserve. I get that contemporary and popping are also difficult, to a degree, but they seem to get preferential treatment on this show – even from Derek, at times, because as an award winning latin dancer, he’s got a tendency to be tougher on the latin dancers. And he’s a tapper too. For that matter, he does killer contemporary…so why does he seem to favor it? Because it gives him all the feels like it does JLo?? 🙂 Anyway, Jonathan y Jorge are up next. Everything I said, above? Holds true here as well. Ah well. I think I’m voting for All Ready as “robbed” from the Upper Division – I think I could replace anyone from the top three except Derion and Madison. How about you? Hmm…at first glance, I don’t think any of these three were robbed. Let’s rewatch their dances. Elektro Crew – I really like them, but I can’t point to any of the three winners (Dancetown Divas, Crazy 8s, VPeepz) and say that Elektro Crew should be there instead. That is, after all, the definition of being robbed, in this case. Get Down District – note here that WoD lists this as a “full performance” when it’s clearly not. Again, not a full routine although it is labeled as such. WoD is doing much better this year, in this respect, but they’re never going to get Emmy Awards if they keep chopping dances up. Anyway, what we see of this routine appears to be at a lower level than the three winners. They should all try again next year after they find better choreography and practice like crazy. So, was anyone from the Junior Team Division robbed?? I don’t think so, but what do you think?? Ah, the Junior Teams Division. Really good to see Jenna Dewan back in a mentoring role – she generally does an excellent job, second only to Derek, IMO. I’m sure it’s not coincidence that the two serious dancers in this cast are the two best mentors. A little plug…the reason that Jenna was NOT in a hosting role this season on WoD is because she had a guest starring (recurring) role on The Resident (Fox). This is an EXCELLENT medical drama – I can’t recommend it highly enough. I love it, and Jenna did a good job in her role. First up, The Crazy 8s. Next up are the Dancetown Divas. Full disclosure, I root for these ladies because they are ballroom/latin at their roots. That makes them DIFFERENT than most acts that go far on this show. Okay, I originally agreed with Ne-Yo about the white gloves, but on re-watching I think it’s not so much the gloves but their floor placement early in the routine. It’s not as clean as it should be…a few of them are just visually in the wrong spot. But damn, this was a cool routine. Love the Latin moves, love the later formations, love the vogueing. This is my routine of the night, I think. You hear Derek say early in the routine “another level” – absolutely true. These kids are on another level. Just brilliant. The red shirt was soooo effective. The routine was so clean. And, seriously, the fact that many of these kids were just sobbing when the routine ended….that is legit emotion, they seriously felt it. That’s when you know a routine was verging on perfect. Just amazing. Okay, I just told you who my routine of the night was…what about the winner of the division so far? That ones a bit tougher. I can’t decide who to vote for, honestly. 🙂 How about you? Tonight we’re going into the Cut with the Upper and Junior Team Divisions. As I recall, all the competitors dance and the top three in each Division move to the next round. If you want to refresh your memory on who the readers of this blog voted for as the top three in each division, check out the post at the link. Great outfits. Death defying move to start with! Followed by many ore great moves. I love these guys. They’re exciting. Seems like a lot more dancing this time around. Read more..
Kayla Mak was our redemption winner. Very good dancer, but too close to Lauren Yakima (who got a 96!!) to likely survive much longer. But I think she was the rightful redemption winner as much as I love me some tap. Yeah, there’s no way that Kayla wasn’t going to win this particular match up. I did love House of Tap’s first number of the night, though. After Kayla, Moving Forward is the low scorer of those moving forward to the next round. I really loved these guys. What they’re going to have to do is clean up their sync some. That’s the advantage that Kayla and Lauren have – they don’t have to worry about being in sync with anyone else. But this is also what makes a group like Moving Forward so visually appealing. Loved it. They are obviously excellent dancers. But I find them falling into the same stuff that other contemporary dancers do – the emotion seems forced or put on to me. I appreciate much more a group like Moving 4ward who don’t try to force it and let the dancing speak. I’ve seen too many dancers actually crying when a routine is over to buy the faux emotion in your average contemporary routine. Why do I like Lauren?? Well, she doesn’t seem to default to weepy emotion. She’s strong, confident and tough…or at least, that’s how she dances. She just kills this routine…and she may just kill the whole competition. 🙂 I keep thinking Game of Thrones when I watch her dance. 🙂 P.S. JLo is full of CRAP. She is one of the reasons that contemporary seems fake weepy 90% of the time. There is NO reason why Lauren’s way can’t be THE way. So, Lauren is my winner…who is yours?? In re-watching JDC, I really did love this dance. I just get annoyed when contemporary is given so much more weight by people like Jennifer who respond to that emotion, real or not. It seemed more real here than it has from other contemporary dancers on this show, so good job. Next up are the Crazy 8’s – I admit, I love these kids. But I liked their first routine better than this one. They picked wisely, but they need to make sure they don’t repeat themselves in the Cut. VPeepz are next – looking at the total youtube views from last week is interesting. You have to keep in mind that the qualifiers took place over three weeks, so some videos have been up longer than others, but they have 2.4 million views which seems to be pretty darn good. Them, the Kings, the Crazy 8’s and Poppin’ John seem to be killing it with the repeat viewers. And in rewatching this performance, I can see why they have so many views. Great dance, even with the slight fumbles. Clean it up for next time, kids!! Took WoD a bit to get Electro Crew up on their youtube channel other wise I would have posted this yesterday!! I liked this routine – not too much Thriller, pretty unique, creepy ending. Watching it a second time I liked it even better than I did on Sunday night. 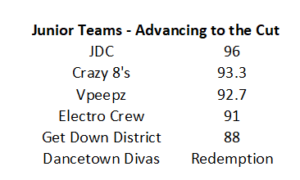 And here is the redemption round, where the Dancetown Divas were victorious over MKAM – good call, in my opinion. Another crushing week of duels – with some very feisty duelers!! The Junior Team Division is NO joke. I saw quite a bit of commentary on Twitter about how the teams were behaving toward each other; comments about poor sportsmanship and how that shouldn’t be reinforced in children. I totally get that point, and at first I felt the same way. But that’s what dance duels are about. As long as they are using that behavior in a way to hype themselves up in the moment AND the good sportsmanship comes in after the dancing is done, then I think I can let it slide. And it certainly seems, from watching the BTS clips, that they do congratulate each other backstage and there is none of that behavior when the dancing is done and the battle is over. Agree?? Or do you still think it was too much?? Since there were only two or three teams who really thrilled me to begin with, I might not be the best person to make this call. 🙂 That’s why I have a poll. Anyway, Battle Droids Crew – the boys from Belgium – were the first ones to be eliminated. Seriously, if you’re going to throw that much shade in your routine, you have to back it up. And I don’t feel like they really did – not as polished as their competition. Next we have Intention – this one makes me a bit sad. They only lost by a point and it was likely due to Jennifer’s not feeling like the music was a good choice. I disagree. I thought Get Down District was too much like a group of high school cheerleaders, while Intention has beautiful roll ups and more…character? Not sure how to describe why I preferred them. Another side note, in the comments on this video someone pointed out that the trick right at the beginning is shown twice – obvious editing mistake. While the commenter adds a nefarious intention to it, I tend to think it’s an honest mistake. I don’t think WoD needs to work hard to get the audience on this side of the judges – there is no gain to doing that. What is the advantage?? The show is giving away a million dollars and, unlike season 1 where it seemed like Jennifer had something to gain with who won, I don’t see to much of that since then. All of the dancers get great exposure – hell, half the people who lost last season are being employed by Derek. 🙂 It’s not like they need to make the audience like Get Down District more because the editors already know they won the whole thing – I find that to be highly doubtful, based on what we’ve seen so far. MKAM is our next eliminated group. I appreciate their honesty, but ya gotta be careful looking at someone who’s made it to the duels as someone easily beaten. As they found out the hard way. In any case, I really liked this dance a lot more the second time around. Were they robbed?? Eh, no, I don’t think so. They chose Electro Crew, and they only lost by 0.3 – very, very close. That’s the way it goes sometimes. ETA: Ooops…completely left out West Springfield Dance Crew getting beaten by the Crazy 8’s. While I’m sad for them, I did think the Crazy 8’s were the better team. And Clowns ARE scary. 🙂 They did a good job, but the Crazy 8’s (the tiny little nuggets) did pick someone they were pretty sure they could beat. I suspect that they have more time to devote to dancing than a high school team does – and it shows. I did like this routine though.